Yesterday I spoke about the tea party I had over at my place on Saturday. I promised the recipe for my apple pie, so here it is. Before you read any further, I must tell you I'm one of those cooks who follows a recipe scrupulously the first time. If I get the dish right, the next time I make it, I'm gonna start tinkering with the recipe. Biggest 'places' I do this are with fat and sugar content. I'm appalled at the amount of fat some recipes ask for, when much less will still do the trick. As for sugar, my husband is diabetic so I always work the sugar low on everything I make. And before you ask, no, I don't 'believe' in those sugar substitutes. Too much bad associated with aspartame and sucralose and whatever else passes for 'no-sugar' in today's culture. I followed a basic cookery course while in high school. So I know my basics, and this allows me to tinker and experiment. The recipe for apple pie calls for a version of the shortcrust pastry so I don't really follow an established recipe for the pastry and just make mine like that. Here goes! This makes a 9-inch pie, which easily serves 6-8. Sieve flour in a bowl. Cut fat into small cubes and dump in flour. Keep cutting the butter with the knife in the flour until it becomes small globs in there. Ditch the knife, go in with the tips of your fingers (just the tips, mind you! ), and rub the fat into the flour until the mixture resembles fine sand. Sprinkle sugar in the 'sand'. Add 2-3 tablespoons of water and start bunching the mixture into a ball. If all is not 'pulling up', add another tablespoon of water. Now if your dough is too sticky, don't despair. Sprinkle some flour on the dough and keep kneading until it no longer sticks. Cover with plastic wrap and place in the fridge for at least 30 minutes. In the meantime, peel, core, and cut apples into small cubes. Place in a saucepan, cover with water up to half the apples' level, add sugar, cinnamon and vanilla essence and set to boil. At boiling point, bring heat to low and simmer until apples are tender. The water should not evaporate - it will form a light syrup in the saucepan. Break into two balls - one is two-thirds of the dough, the other the remaining third. Roll the bigger ball of dough out on a floured surface in a round (or somewhat round!) disk. Lift up and place in your pie dish. Prick with a fork all over the dough and bake blind in a moderately-hot pre-heated oven (200 degrees C, 425 degrees F). Take pie dish out of the oven. Let cool slightly. 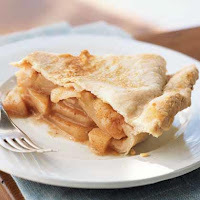 Fill pie shell with the apples. Roll out the remaining dough and cover the pie with this, making sure you seal the edges using pressure from your fingers. Cut slits into the pastry top. Sprinkle with sugar (or if you want, some of that syrup from the apples if you have too much). Bake for 30-35 minutes, or until pie is golden. There you are - an easy apple pie! Sounds yummy, Zee. To bad I can't bake my way out of a wet paper bag. Lol. I'm copying and saving. My dad loves apple pie. I'll have to make one for him next time we get together. Lol Lynn. Your comment made me laugh!! Mmmm, that sounds good. Thanks for sharing!